Based in Hong Kong, online retailer Bug Bee Boom Jewellery prides themselves on impeccable design and stunning details. Usually you would expect this to come with a high price tag but Bug Bee Boom Jewellery have hit the trifecta by ensuring all their jewellery and accessories are affordably priced. When Bug Bee Boom invited me to try out their designs I spent hours trawling their website to ensure I picked exactly the right piece. 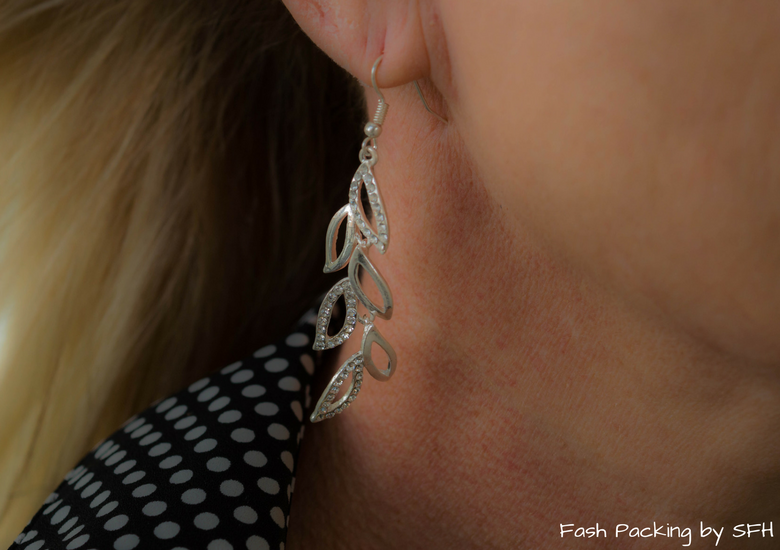 These delicate silver and rhinestone earrings I chose are perfect for adding a little extra sparkle to any outfit. And did I mention they are only AUD$27? Pants are my life for the office. I can probably count the amount of times I have worn a dress to work on my fingers. I just feel so much more comfortable in pants. When you find a good thing I reckon you should stick to it and I have these Express Editor Ankle Pants in a rainbow of colours. My latest are traffic light red. 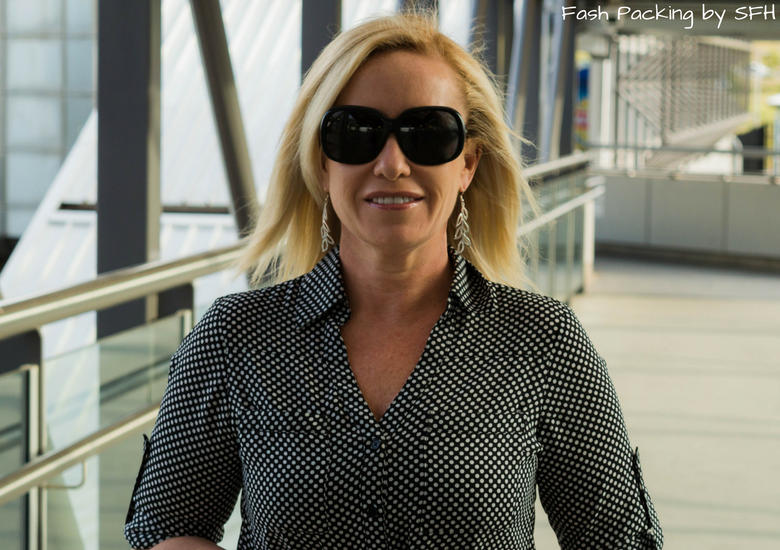 I am in head to toe Express today because I am pairing the pants with one of their iconic Portofino shirts. They guys are my saviour. The original cut I favour (slim cut also available) has plenty of room so you never feel restricted and they wash and wear like a dream with no need to iron. Rather than a block colour which could have been overwhelming with the bold pants I opted for black and white polka dots and kept the rest of the accessories simple with silver and black. Top: Express. Black and White Dot Portofino. Pants: Express. Editor Ankle Pants. Shoes: Furla. Carmen Sandal. Bag: Dior. Earrings: C/O Bug Bee Boom. High Polished Plated Rhinestone Earrings. Watch: Nixon. Sunglasses: Prada. Have you heard of Bug Bee Boom jewellery? I would to hear your thoughts in the comments below. Disclaimer: My earrings were provided care of Bug Bee Boom Jewellery. This post contains some affiliate links which if clicked will earn me a few cents. As always all opinions are my own. Stunning pants, Allison. They do indeed look well-made and, most importantly, fit ever so flatteringly. And I love how your top is polka dots, such a whimsy touch, with that unexpected button flap at the sleeve cuffs. Thanks Sheela. I’m loving the polka dots with this. Block colour would have been way too much! These earrings are beautiful. 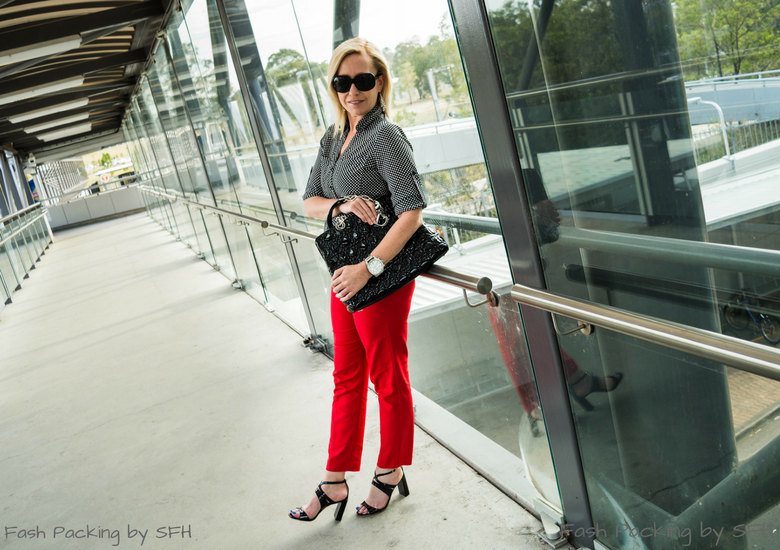 This red pants and black polka dot blouse are great combo. Very chic. Thanks so much Anna ? I always wore pants to the office because the office was always so dang cold! And I worked in publishing, not a drs office .. lol. My office too. Even in the middle of summer! Thanks so much Amy. I’m a bit in love with polka dots at the moment ? Thanks Casey and thanks for joining ? Love the black and red look but the pretty earrings is a show stopper. Thanks Sheree. They are vey light as well so easy to wear ? Love the shape of those earrings! Exactly Jennie! So unusual ? Thanks so much Trina ? I’m a silver jewelry person as well. Love the red pants and black & white polka dots. Love every part of this outfit, as a matter of fact! Thanks for the linky and have a great day! Cute outfit, I love the pop of red pants! Those earrings are fabulous too. Thanks Cathy. There were a great find ? Love those earrings!!! So pretty!!! You look amazing! Awww thanks Stephanie. I love the earrings. I can see these getting a lot of wear! Thanks ? Loved your outfit Jackie. It was perfectly put together. I’m not sure I could cope with snow! I’m very eagerly awaiting the arrival of summer right now after what feels like a very long winter! I love the red pants on you, and those earring are gorgeous! Thanks for the link up! Loving these red pants and the pattern of this blouse! Thanks for hosting. Those earrings are fabulous! Love your red pants too! Great color & print combo!!!! Thanks Rebecca. I’ll check orbit ? Beautiful earrings and very reasonably priced too! I love your red trousers…I have a pair in bright red and I wear them lots for work. Thanks Emma! Red for work makes a fabulous change from the sea of black in the office ? 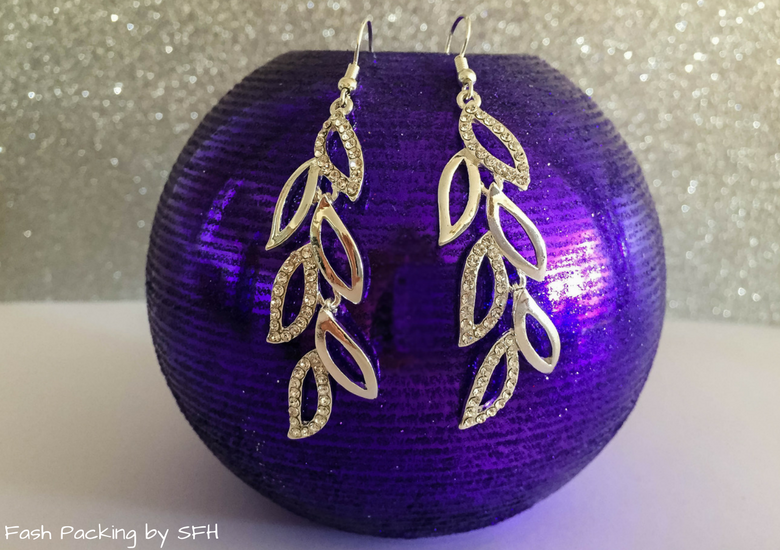 These earrings are stunningly beautiful! They really add something special to your chic look. Thanks for the link up! Thanks Kathrine. I think I chose well from their great range ? Thank you so much for the shout out Allison! Those are great earrings and I love the pedi. You are very welcome Debbie! Great look ? Those earrings are gorgeous! I love the whole look, especially the red trousers. Those earrings are beautiful and they look lovely on you! I really like your red pants too 🙂 Thank you for the link up! Thanks so much Mica ?